Data will become an even more valuable commodity, as we advance in the Fourth Industrial Revolution. We live in an unequal world where the gap between the rich and poor is widening. As the Fourth Industrial Revolution transforms our world, it is more important than ever to embrace the challenges of automation and the major disruption it will cause the labour market. According to the Future of Jobs report, around 75 million jobs may be displaced by a shift in the division of labour between humans and machines. Many fear that artificial intelligence (AI) systems will replace human workers who currently carry out routine tasks. That creates a risk of an even more unequal world, where only the people with sufficient technical abilities and access to basic digital education can thrive. To find solutions to this problem, we need disruptive ideas. So, how about creating a Universal Basic Income that could reduce the risk of exclusion? What if this Universal Basic Income is based on our data? Nowadays we practically give our data away free of charge, to the big tech companies. They use our data to create more personalized products or services for us, but their real business is when they commercialize it. So, we need to ask some important questions: who does data really belong to, who is the owner of the data, and why don't we get paid for it? Every single day, humans produce a huge amount of data; about 2.5 quintillion bytes’ worth, according to research by technology writer Bernard Marr. Google processes over 40,000 searches every second and around 1.4 billion people use Facebook every day. Every minute, 16 million text messages are sent, 154,200 calls are made on Skype, 990,000 Tinder swipes happen, 156 million emails are sent, 45,788 trips occur on Uber, and 600 new pages are created in Wikipedia. This growth of data creation is expanding, as we use more and more devices with the Internet of Things. In recent years, we have created more data than all human history combined. Despite this amazing production of data, the producers of the data – we, the people – receive no value for it apart from some "free" services, like Facebook, which, in reality, works to gather yet more data. The big tech companies are the real winners in a free data world and that could create a more unequal world, at a time when we need inclusive capitalism. 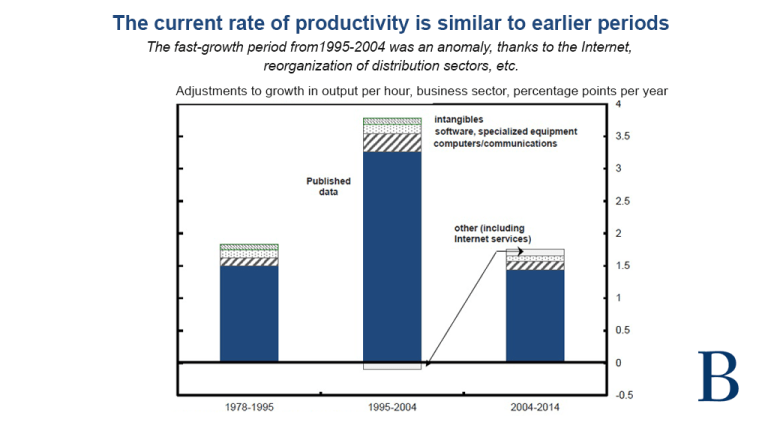 Research on productivity in the US, by David Byrne and John Fernald from the Federal Reserve and Marshall Reinsdorf from the IMF, found that a purely free data economy acts as a drag on productivity growth, which continues to lag worldwide despite the hopes of AI potential. Something must change in order to boost inclusive growth. Moreover, anxiety about future jobs losses in a digital economy creates resentment about globalization and institutions, which tends to stimulate populist movements to both the right and left. These movements exacerbate nationalism, close borders, and are against free trade. These are important social and political risks that need to be tackled with an inclusive solution. The Fourth Industrial Revolution requires tonnes of data for the business models of the future. Machine learning, AI, and more sophisticated robots and machines all work with data previously created by humans. They need data to learn, get better at what they do, and became a product or service with commercial use. However, nowadays a real incentive does not exist to contribute to creating high-quality data to empower all these technologies and maximize the potential of the digital economy. Today, only a few users are aware of the productive value of their data and the role they play in the machine learning market. As we advance in the Fourth Industrial Revolution, data will become an even more valuable commodity. This information and digital economy is built on data; many AI systems depend on active participation by humans to generate relevant data. So how can we find a solution that breaks the current paradigm of a world where data production is free, to create a more inclusive, ethical, and transparent model? Universal basic income based on the data we produce could be the answer. This idea was first conceived by Jaron Lainer in his 2013 book, Who owns the future? In the book, he criticizes the tech industry for accumulating and evaluating consumer data without acknowledging a monetary debt to the people for all this free information they create and give. He also argues that the lack of targeting of incentives undermines market principles of evaluation, skews the distribution of financial returns from the data economy, and stops users from developing themselves into “first-class digital citizens”. Eric Posner and Glen Weyl argue in their 2018 book, Radical Markets, that paying people for data would raise US household median income by $20,000, – a bigger increase than the uplift in the post-war era. In order to create a Universal Basic Income of Data, the data we produce needs to be valued for what it is, i.e labour. But in order to work, there are some questions that need to be answered. 1. How to fairly and effectively value data? 2. Who will negotiate the basic income for the data? 3. With data becoming actual labour or income, how will we protect it from theft? 4. How to enforce the labour payments from the companies that use the data? 5. What is the role of government in this new market? It is time for economists, policymakers, entrepreneurs, and academia to start finding the answers to these questions and embrace this solution as a real possibility for a more inclusive future of capitalism. If this idea is implemented, data, along with AI, will be viewed as a new source of well-paid jobs and income supplements, rather than as a threat to the people and workers. The value of the digital economy would be shared among citizen producers of data, creating a fairer economy for all. A new era of economic growth and technological development could be reached.